The bold brown line is the “saltiness” measurement – electrical conductivity. What are we seeing? Sometime on June 10th, I pulled the sensors out of the ham, rinsed off the salt it had been sitting in, packed it with lard, peppercorns, and some red peppers, and hung it in the fridge to cure. This shows up as a massive negative spike on the graph – useful because I don’t need to remember exactly when this happened. What we see is that, up to the change, more and more salt was being taken up by the ham. After removing it, however, there has been essentially no change to its salt content. The ups and downs on the graph are likely due to changes in temperature, and overall, readings haven’t changed much. That temperature point is also important to consider. Every time we see temperature go up, we see moisture content reading increase, and the salt reading decrease. 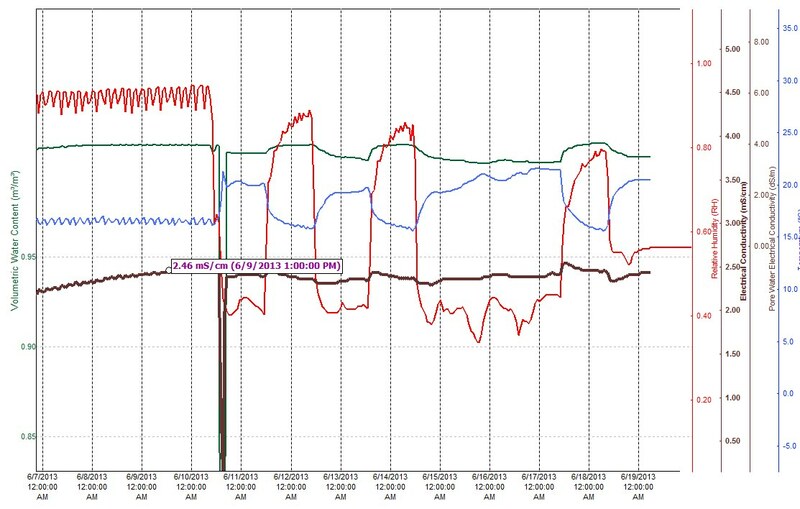 Both of these changes are likely unrelated to actual trends, but the sensors appears to show a small amount temperature dependence. 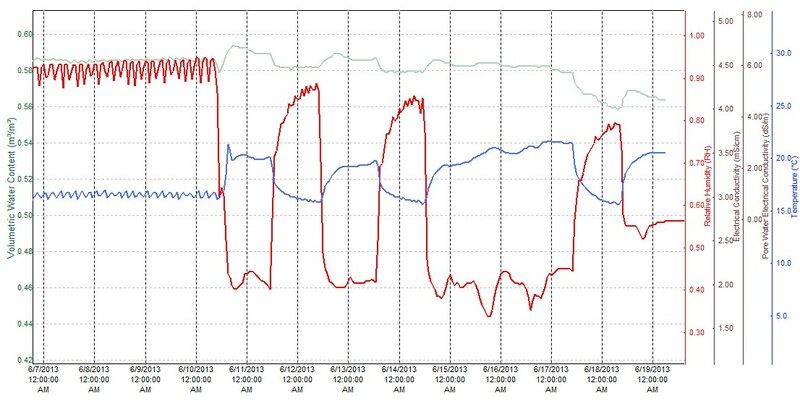 The large cycles in humidity that you see on the graph result from trying to get the fridge humidity down in the 60-70% range. I do this by leaving the fridge door open for a day or two. As yet, the lowest I’ve achieved with the door closed has been 80% – still too high if we want to avoid mold growth. Water activity theory tells us that most mold won’t grow if humidity/water activity is below 70%/0.7 aw units. Each time I shut the door, the still-kinda-new sausage is releasing enough moisture that it raises the humidity into the danger zone. It’ll eventually be fine, and I’ll be back to using the humidifier to maintain a 60% humidity level. The nice thing about the remote sensor is that I check the humidity from my desk, and then run out to the fridge if the reading is too high. We expect the salami to be done in a couple of weeks, while the prosciutto will take almost a year, so no surprises here yet. In the next post,we’ll look at the data from our cheese that’s been aging for a couple of weeks now.